Take one group of young college men at Rose Poly seeking to start a senior chapter of the order of Demolay, one graduate chapter of Phi Gamma Delta seeking to establish an undergraduate chapter at Indiana State University, and one Fiji hierarchy totally uninterested in same Rose Poly, and mix well. Let simmer for ten years, stirring frequently, and you get a Fiji chapter that is the strongest, most balanced chapter on the Rose -Hulman campus. If that was a little too fast for you, then read on. Let's investigate the undergraduate angle first. After their original notion was repulsed by the Demolay home office, they decided to survey the possibility of forming a sixth social fraternity at Rose. This idea was greeted with enthusiasm by both the students interested and the school administration. (Excepting Ralph Ross.) So, in the spring of 1968, the fourteen sophomores and one junior whose lives were to become so intertwined in the next few years set out fraternity-hunting, knowing that they had to fill a void in their lives and the school atmosphere at Rose that was not filled by the five fraternities at the time. From the Core Group's Historical Notes, "There was indeed a strong sense of spirit and cooperativeness among those who wished to become a part of the building social organization, and in a few short weeks, the group of 15 core members emerged as an optimistic, energetic unit." The first group meeting was held on April 11, and Bruce Williams was elected President, with Sid Stoffer becoming Secretary. Already, Phi Gamma Delta was the most favorable choice of the group members. In subsequent meetings that month, great progress was reported. The IFC resolved to help the Rose Poly Colony Core Group become the next social fraternity on campus. The Rose Faculty Committee gave the group formal permission to proceed in seeking fraternity status. Phi Gamma Delta remained foremost In their minds. The fourth meeting on May 8th saw an operating budget established, and the committee structure organized. The next meeting held quite a disappointment in store for the group members. Phi Gamma Delta had informed the group that Rose was not on their approved school list, and a time consuming process was involved in colonization. Instead of becoming discouraged, the Core Group became only more determined to meet immediately with local graduates of Phi Gamma Delta to learn more about the fraternity. This initial meeting consisted of a presentation by Dr. Frank Guthrie and Dean Donald Mighell, followed by a question and answer session. These men too had known disappointment, for in the previous year their attempts to start a Fiji chapter at ISU had failed. Coming off this setback, they understandably were not too interested in forming a chapter at Rose Poly, and in fact at this meeting tried to discourage the Core Group by explaining the long process necessary to get on the provisional list, colonize, and finally install a chapter. But the Terre Haute Graduate Chapter failed to account for the intelligence, cohesiveness, and determination of this band of young men. This group would not give up easily. So impressive were these young fellows, that only eight days after expecting to brush off the men from Rose, the Graduate Chapter found itself asking for a definite commitment from the Colony Core Group. The group agreed to commit, with the stipulation that the Graduate Chapter would present the Core Group's case at the forthcoming Bahamas' Ekklesia. On May 29,1968, a firm seal was placed on the relationship that would last and grow for years to come. "120th Grand Bahama Ekklesia, 9.27 a.m., Aug. 24, 1968. Placed Rose Polytechnic Institute on provisional list and directed immediate establishment of Delta Colony. This accomplishment by the Graduate Chapter shortened the Delta Colony's road to installation by one to two years. From the Notes, "This action was unusually swift as 200 schools were awaiting colonization, and was due to the fine group already established,"
“As a fraternity we want to add to the formal education of the Rose curriculum. We want the refinement of each member. We want the experience of belonging to this fraternity to enrich each member's life both before and after graduation. We want to emphasize to each member that he is an individual and to assist him to develop as such. But at the same time we want to cause him to realize that he is not an isolated individual. He is a member of this fraternity, he is a student at Rose; he is a citizen of this nation. And we want him to be aware that each of these associations requires of him specific responsibilities and obligations. Ahead lay a tough pathway for the fifteen, for the Delta Colony was far from being a strong social fraternity, much as a new pledge is far from being a good active. This was a year where activities were the order of the day, with colonization at the beginning of the school year, less than six months after the first organizational meetings of the Rose Colony Core Group. This event was rapidly followed by the building of a homecoming display, freshmen rush, as well as rush to strengthen the numbers of upperclass members, and pledging and initiation ceremonies. The first annual retreat, participation in our first Fiji State Day, and the acquisition of a house for the colony also highlighted this year. This year saw the beginnings of traditions that, it is hoped, will continue for years to come. 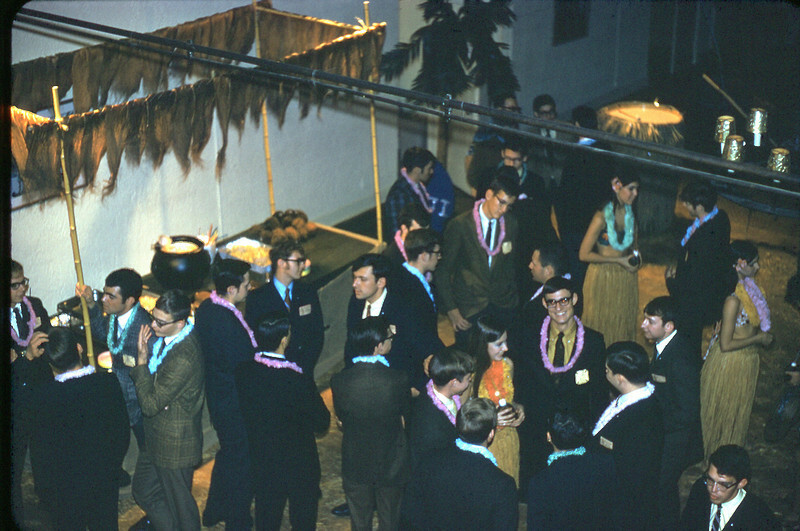 Traditions such as the Fiji Rain dance performed prior to the opening of the intramural football season, and the delivery of "bone" invitations to the Fiji Isle, as well as the tradition of the Fiji Isle. Brotherhood cannot grow in individuals overnight, but together we have a common goal, that of obtaining our charter into Phi Gamma Delta as rapidly as possible, and with this to guide us, we are able to do next to the impossible (which has been the natural way since the earliest founding of our colony), and the bonds of brotherhood are growing each day. The fo1lowig is a list of important dates during the year for the De1ta Colony. August 10, 1968 - Dinner meeting of Rose Poly Colony Core Group with members of the Phi Gamma Delta Graduate Chapter and the Rose faculty and administration: This meeting constituted the formal presentation by the Terre Haute Graduate Chapter of their desire to take the initiative in helping the Core Group to become a Delta Colony of Phi Gamma Delta. They announced that members of the Graduate Chapter would be in attendance at the 120th annual Ekklesia, held in the Bahamas during August 21-25, and would submit petitions for placement on the "school provisional list" for colonization from both Rose and Indiana State University. "120th GRAND BAHAMA EKKLESIA, 9:27 AM, AUG. 24, l968. PLACED ROSE POLYTECHNIC INSTITUTE ON PROVISIONAL LIST AND DIRECTED IMMEDIATE ESTABLISHMENT OF DELTA COLONY. WILLIAM R. MILLER and DONALD MIGHELL." This telegram in essence, climaxed months of effort on behalf of the Core Group members and the Terre Haute Graduate Chapter of Phi Gamma Delta to secure affiliation with this national fraternity in the form of colony status on the Rose Polytechnic Institute campus. The words contained in the telegram formally established the Rose Poly Colony Core Group as a Delta Colony of the Fraternity of Phi Gamma Delta. This action was unusually swift as 200 schools were awaiting colonization, and was due to the fine group already established. October 1, 1968 - After the Inter-Fraternity Council gave its support and approval of colonization of the Core Group into Phi Gamma Delta, it recommended giving official approval to the Rose administration. Thus final approval for colonization on the Rose campus was given by the Faculty Committee for Student Organizations, establishing a Delta Colony of the Fraternity of Phi Gamma Delta at Rose Polytechnic Institute. October 7, 1968 - Colonization activities: Dinner with graduate and undergraduate chapters, followed by the formal pledging ceremony in the Hulman Memorial Union Building on the Rose campus. Pledges at this time were the Immortal 15, the founders of our colony. 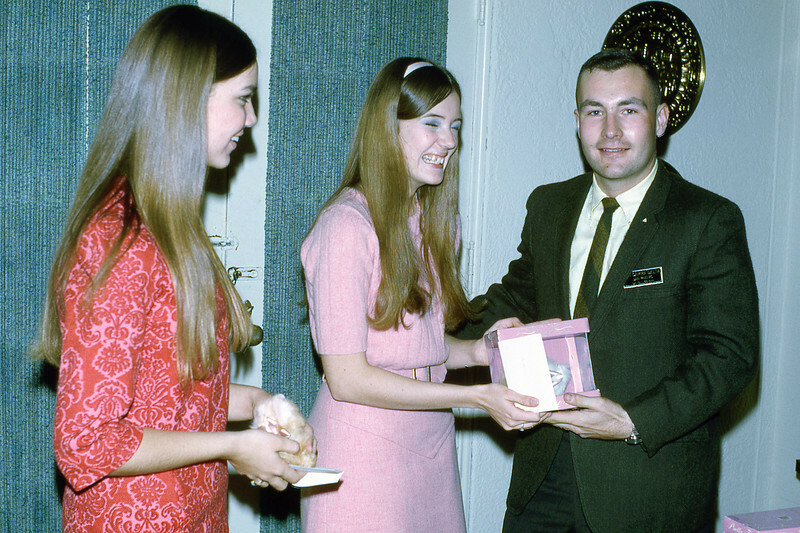 October 13, 1968 - Open house and rush for sophomores: this constituted the first formal rush conducted by the colony members. As a result of this rush party and a mixer that sophomore rushees were invited to attend, eleven sophomores were accepted as pledges into the Delta Colony and thus formed the second pledge class. 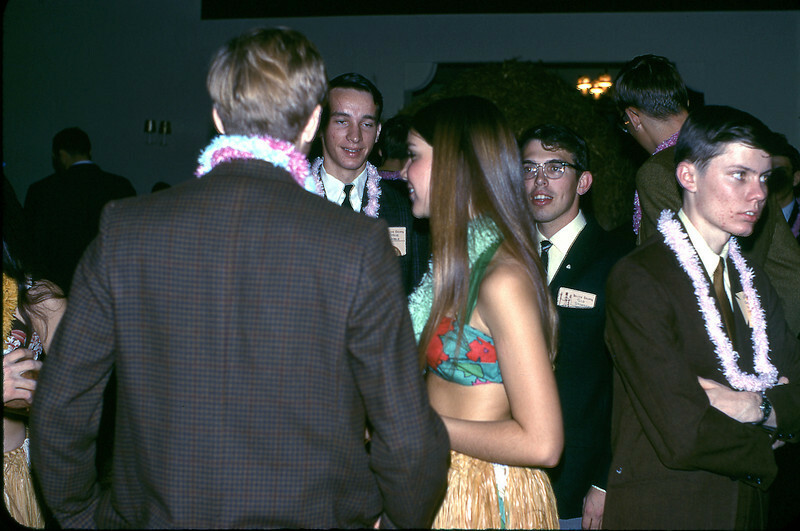 October 25 & 27, 1968 - Freshmen get-acquainted parties: this is the first look the freshmen had of the Delta Colony, and vice versa. These parties were held at the Lutheran Center in Terre Haute, Indiana. October 28, 1968 - Formal pledging ceremony for the second pledge class, held in room E208 of the main building of the Rose campus. 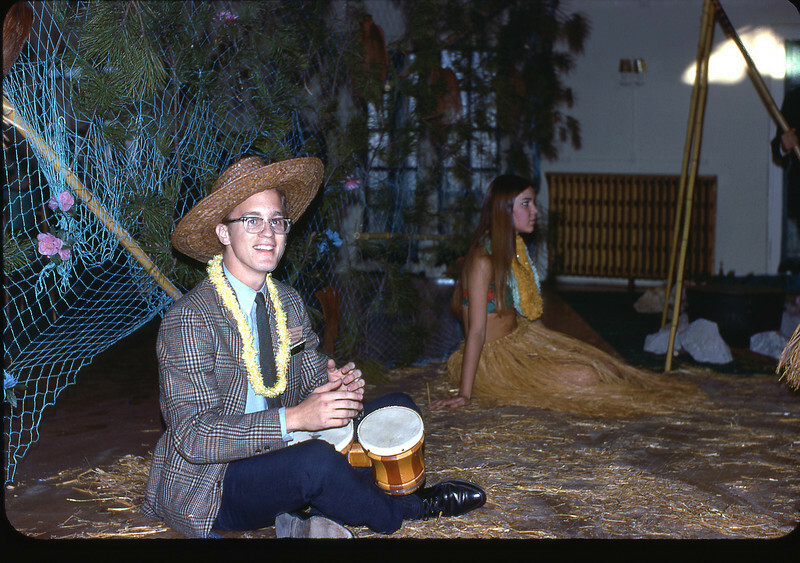 November 8-10, 1968 - Homecoming 1968: participation included building a display, attending the game and the dance. 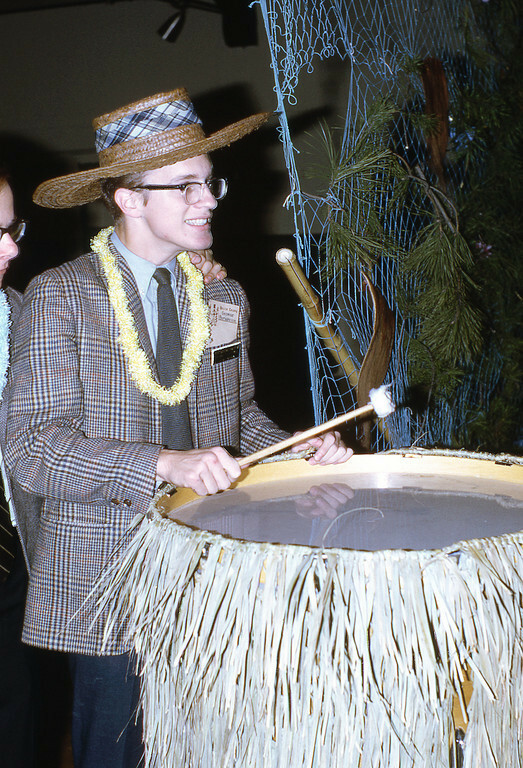 November 22 & 24, 1968 - Rush party with a Polynesian Island theme, held at the Phoenix Country Club in Terre Haute. The entertainment was provided by dancers from Butler University. December 3, 1968 - Formal initiation ceremony for the first pledge class at the Washington Avenue Presbyterian Church. Those initiated were; George Butkovich, Ed Dye, Gary Gladish, Gary Groff, John Hodsden, Jim Lowes, Bob Meyer, Richard Newman, Rick Pace, Dan Phelps, Ted Smith, Sid Stoffer, Steve Whitesell, and Bruce Williams, making the total number of actives fourteen. January 4, 1969 - Formal initiation ceremony for the second pledge class at the Washington Avenue Presbyterian Church. Those initiated were; Tom Dehne, Loren Doyle, Steve Goble, Bob Harrison, Tom Hendrickson, Roger Martindell, Don Morris, Jay O'Sullivan, and Al Wernz, thus bringing the total number of actives to twenty-three. January 10, 12, 17,& 19, 1969 - Informal rush parties held at the Holiday Inn Motel in Terre Haute. As a result of these rush parties, one sophomore and nine freshmen were accepted as pledges into the Delta Colony. 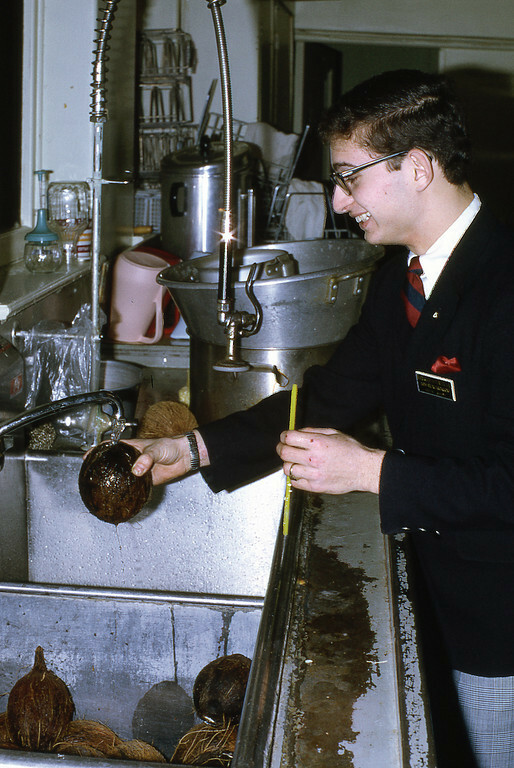 February 1, 1969 - Work day for the United Fund where members of the colony had a chance to work for the Goodwill Industries. February 8-9, 1969 - First annual retreat, held at Brown County State Park (Abe Martin Lodge), included in the activities were the pledge father-son tug-o-war, formal pledging ceremony for the third pledge class, and fellowship that lasted well into the early morning. March 1, 1969 - Fiji State Day: the first Section Convention that the colony attended. Such activities as bowling, bridge, and basketball competition were enjoyed by the colony members, as well as the banquet in the evening. April 2, 1969 - A tour was taken by colony members and members of the local graduate chapter of a prospective Fiji house. The house was located at 1121 South 6th Street - in Terre Haute, Indiana. April 7, 1969 - Installation of officers for 1969-70. Installed were; Bob Meyer-President, Steve Whitesell-Treasurer, Steve Goble-Recording Secretary, Don Morris-Corresponding Secretary, and Richard Newman-Historian. April 19, 1969 - First annual Pledge Class Car Rally and Picnic: This is an annual event to be planned by the pledge class. It was held this year at the Lincoln State Park in Marshall, Illinois. April 25, 1969 - The graduate chapter and housing corporation met, and submitted a bid for the purchase of the Barhydt house at 1121 South Sixth. 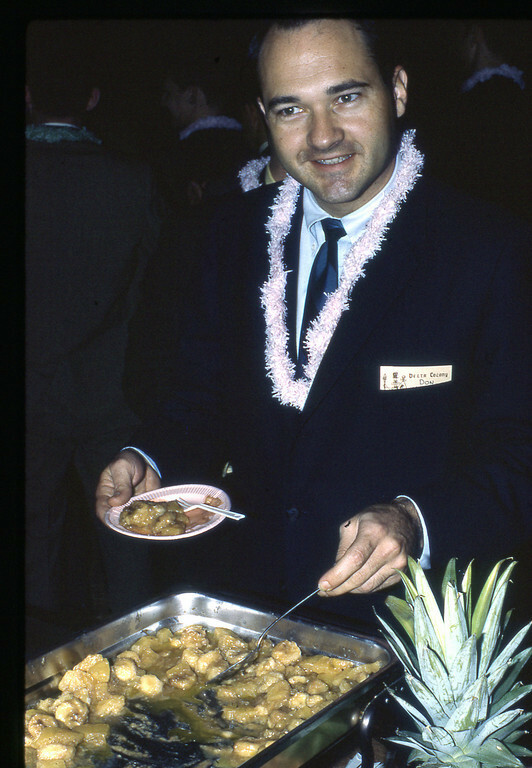 May 1, 1969 - First Norris Pig Dinner sponsored by the Rose Poly Delta Colony. This event was attended by the members of the colony, the local graduate chapter, and other chapters throughout the state. It was held in the private dining room of the Hulman Memorial Union on the Rose Poly campus. 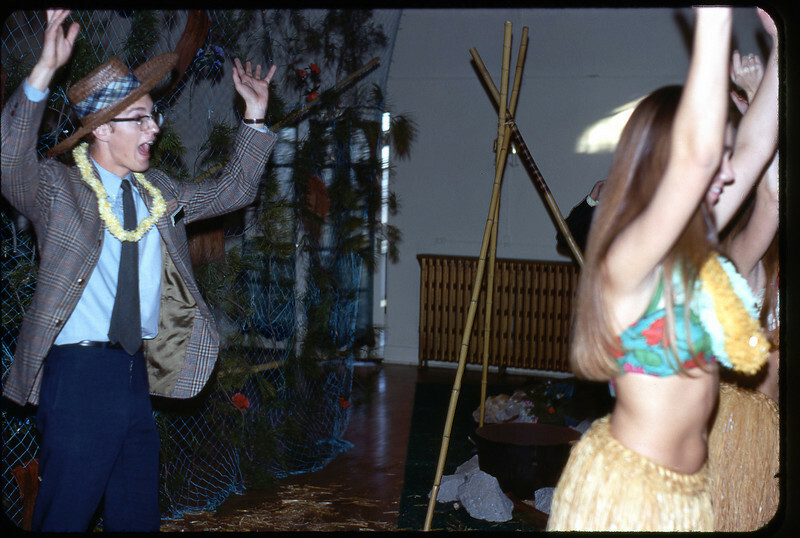 May 10, 1969 - Greek Day at Rose: many activities were enjoyed by the colony members. May 12, 1969 - Formal initiation ceremony for the third pledge class at the Washington Avenue Presbyterian Church. Those initiated were; Jim Graham Tom Jackson, Kevin O'Sullivan, Joel Sanders, Jay Sensibaugh, John Smith, and Dale Zelesnik, thus bringing the total number of actives to thirty. May 17, 1969 - First Fiji Isle party: Many weeks work went into preparing a place at the Isaac Walton Beach to hold our first Fiji Isle party. This party was enjoyed by everyone, including the chaperones; Dr. Frank Guthrie and Donald Mighell. Things were moving in a whirl of activities now. October 25 and 27 marked the first look the freshmen had at the Delta Colony in "Get-Acquainted Parties" held at the Lutheran Center. The second pledge class was formally pledged on October 28. A display had to be built for the Homecoming parade on November 9. The brothers came up with a formal rush party with a Polynesian theme at the Phoenix Country Club in late November that is the forerunner of today's South Sea Isle party. On December 3, fourteen of the initial members were formally initiated into the Delta Colony. Of course, not all was serious. There was the Fiji Rain Dance prior to the football season. The team may not have distinguished itself on the scoreboard, but one thing was sure: everybody played. The Intramural bowling team swept to a first place finish. Parties and mixers were held with sororities from ISU. The chapter was justifiably proud at having brother John Hodsden as Student Government President, and at winning the IFC Scholarship Trophy hands down. The colony began moving into high gear after a breather at Christmas. On January 4, the second pledge class was formally initiated at the Washington Avenue Presbyterian Church. Nine men were initiated, bringing the total number of actives to 23. During the next few weeks, four more rush parties were held at the Holiday Inn, with the happy result of bringing one more sophomore and nine freshmen into the chapter. The Chapter was soon involved in a big social service project, working for the United Fund and Goodwill Industries. The next weekend brought the first annual retreat, this one at the Abe Martin Lodge, including the "Pledge Father-Son Tug-o-war", formal pledging ceremony for the third pledge class, and fellowship that lasted well into the early next morning. This one weekend truly brought the chapter into a unified whole, dedicated to obtaining its charter as quickly as possible. On March 1, the Colony attended its first State Day, and enjoyed meeting brothers from chapters across the state at the banquet and in athletic competition. Then the first annual Road Rallye allowed the pledge class to show its stuff, and harass the actives as well. April 25th proved to be one of the most important days in chapter history as it was decided to purchase the Barhydt House on 1121 South Sixth Street as a permanent home for the chapter. It provided a place where 29 men could live and grow together in brotherhood, as well as being the most beautiful fraternity house at Rose, a great selling point during Rush. The first Pig Dinner was held on May 1 in the Hulman Union. While there were no Colony graduates, there were members of the Terre Haute Graduate Chapter present, and brothers from around the state. On May 12, seven members of the third pledge class were initiated, and the number of actives now stood at thirty. Finally, to round out the year, the first Fiji Island Party occurred at the Isaac Walton Beach. There were problems, such as rain and poison ivy, but all the brothers and their dates still could not help having a good time, with all of the accomplishments of the past year behind them, and the challenges of the coming year confronting them, not the least of which was preparing a house for 29 men. Note: This summary is from The Owl That Roared, history of the Rho Phi Chapter from 1969-1979. This book was edited by Paul Curtin. Contributors were Rick Cahill, Roe East, Frank Gavrilos, Blair Hughes, Dave Oakley, Dave Parker, Anil Patel, Paul Sechrist, Randy Shinkle, and Perry Stephens.